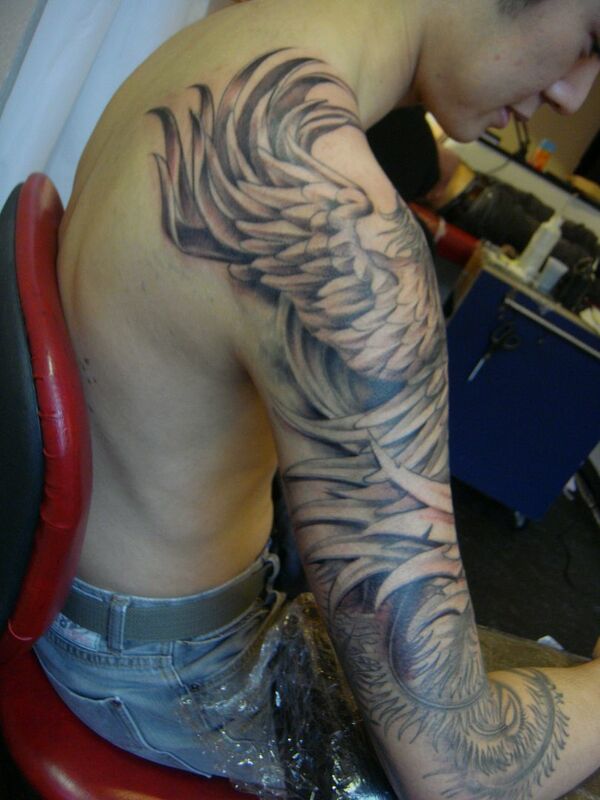 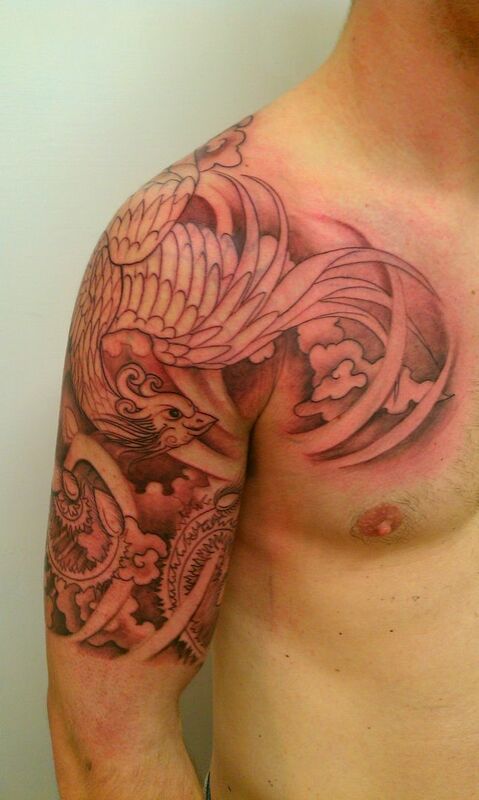 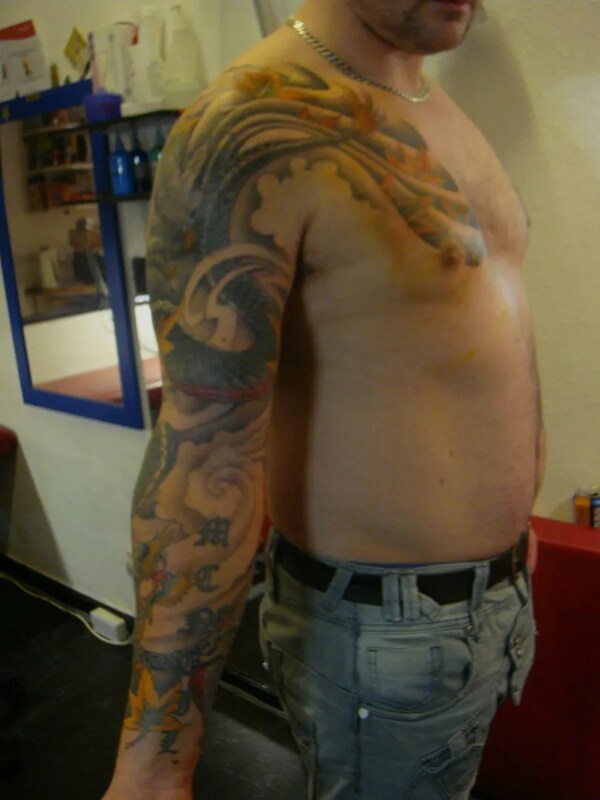 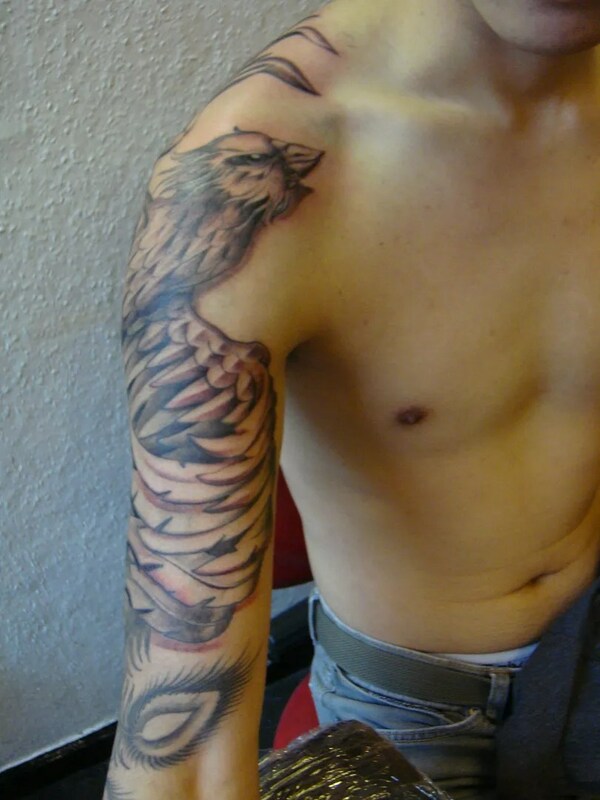 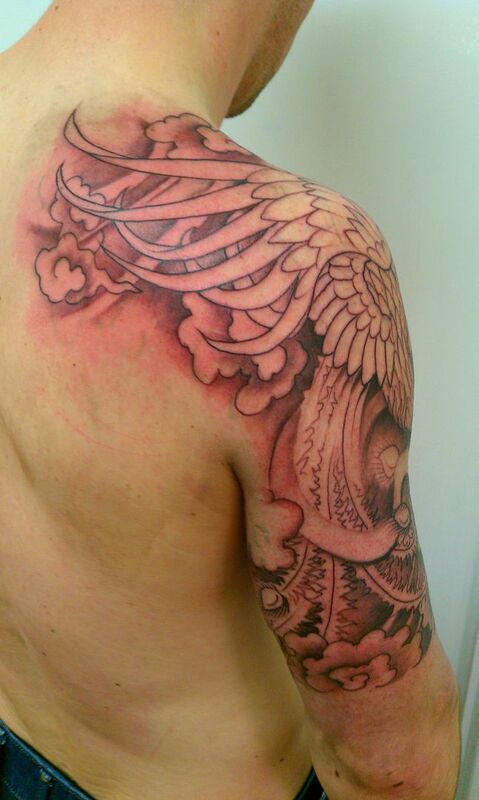 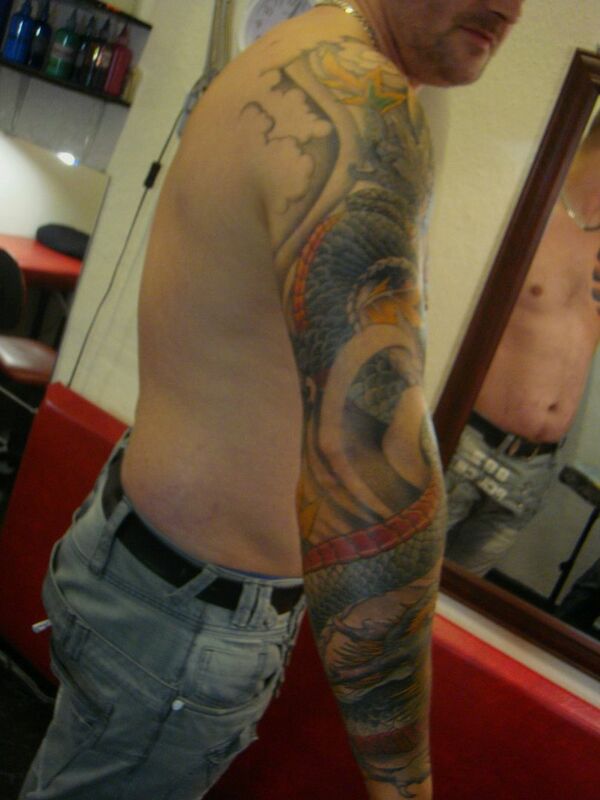 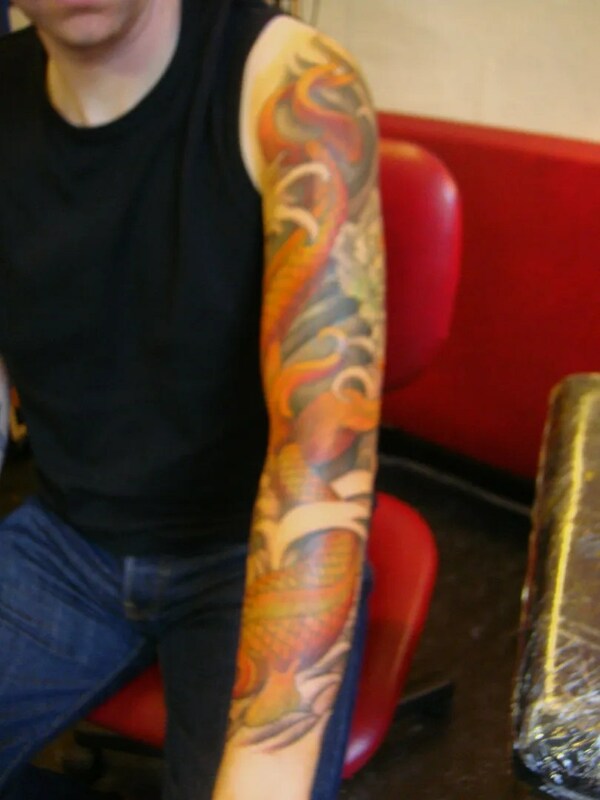 and I started a new phoenix on dave. 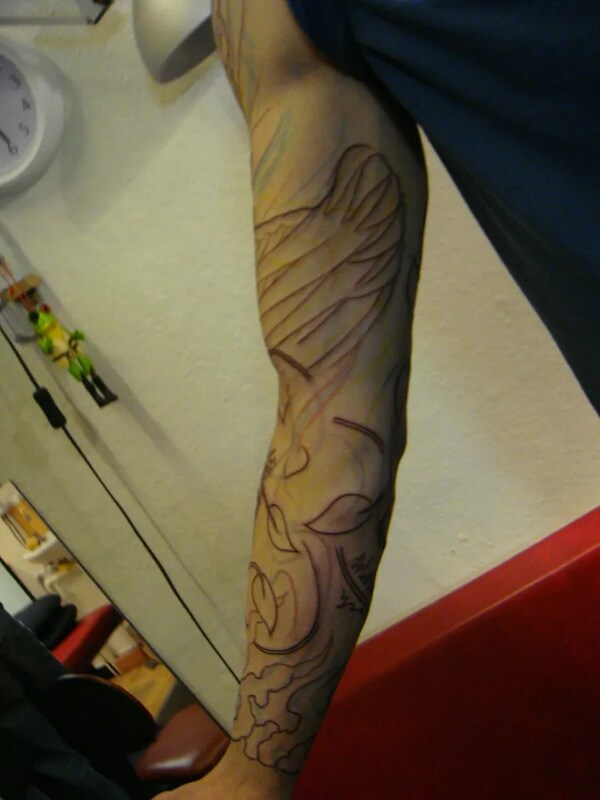 He wants a full sleeve in colour, and today we got the lines mostly done, some feathers still to finish lining. 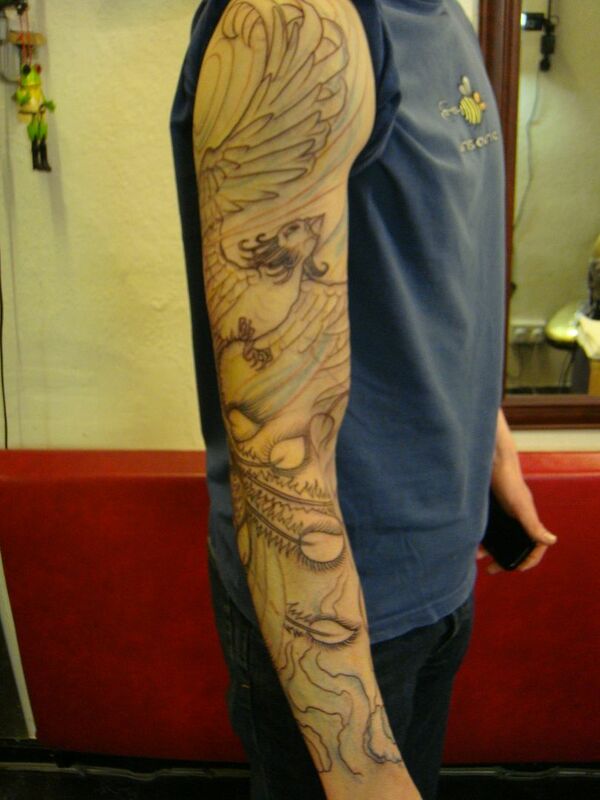 I really enjoy drawing these straight onto the skin, you can bend the tail feathers and wings anyway you please, make the wind blow around the joints and muscles of the arm, really animating the bird. 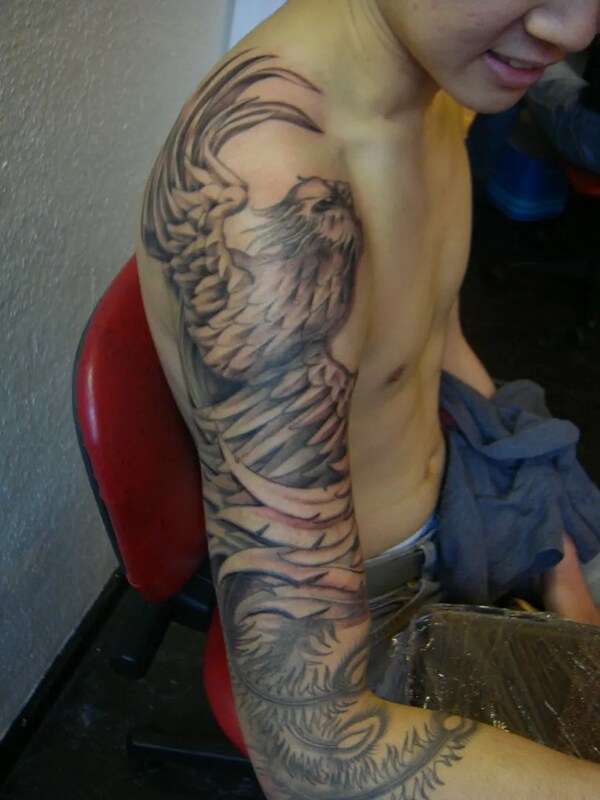 Another phoenix started in Glasgow the next day, Kenny wanted a half sleeve and didn’t mind if I went onto his shoulder, so I did 😀 . 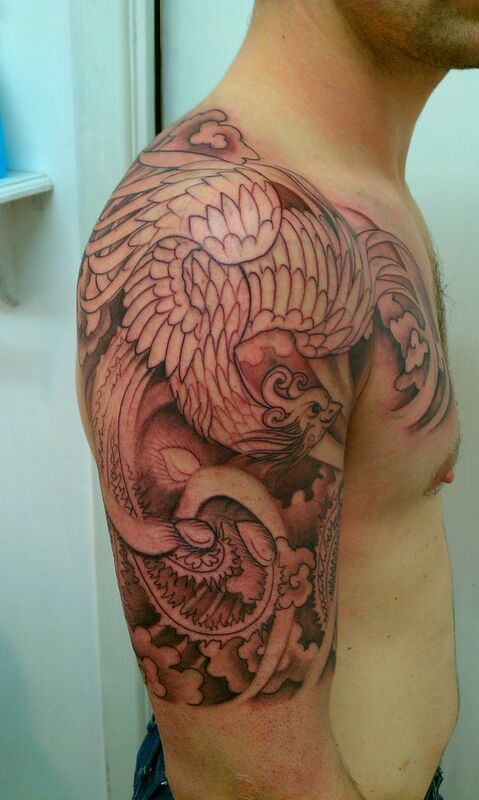 lots of fun bending the wings and tail feathers again, and trying to make this bird look different from the others. 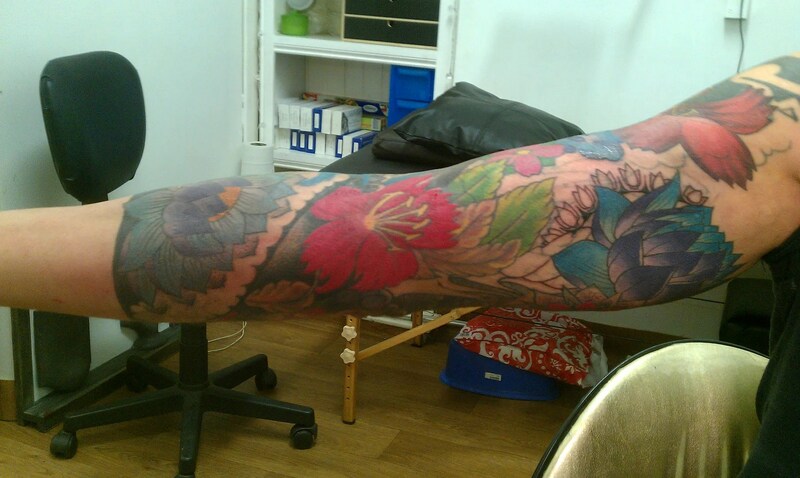 This one will be full colour again. 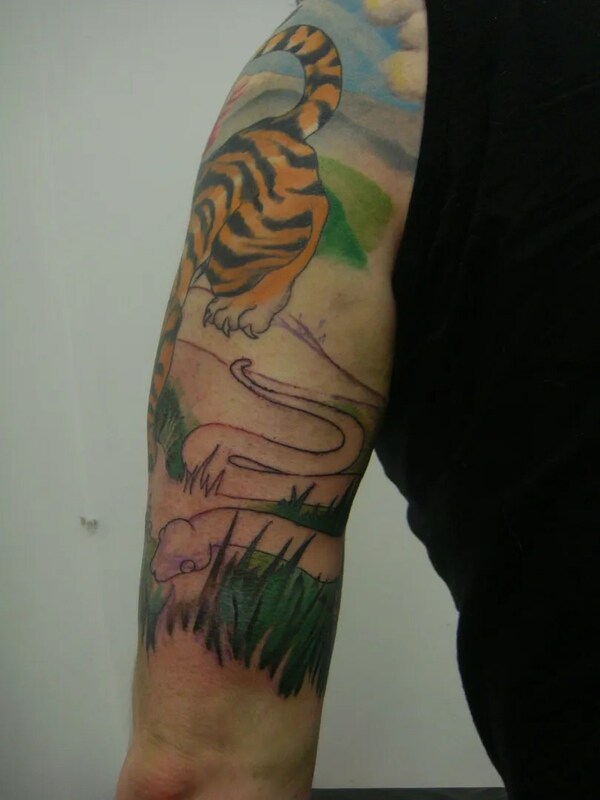 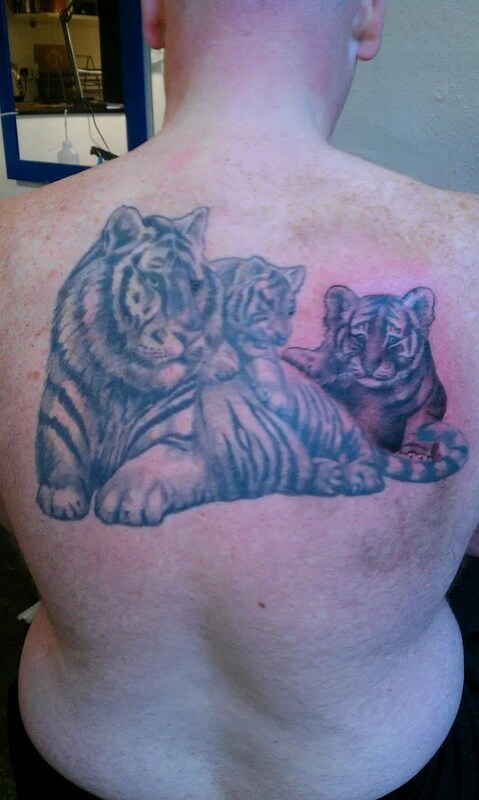 I also started a cover up. 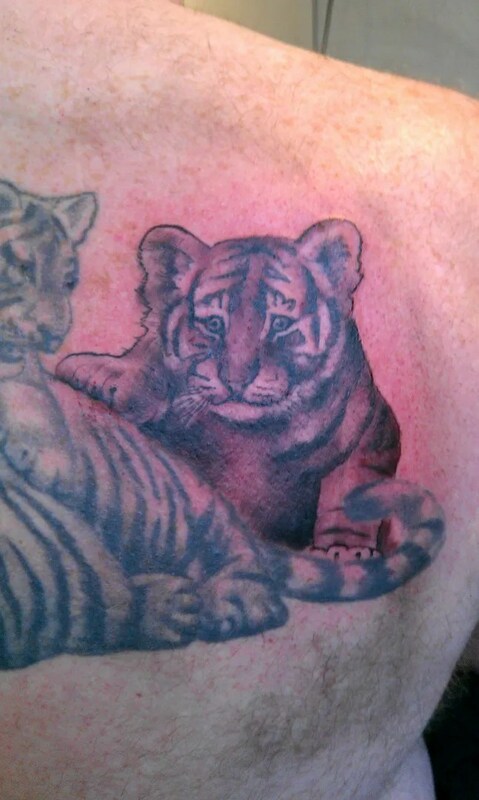 This was booked 6 months ago, with the understanding that he was to get some laser sessions done in the meantime to lighten it up. 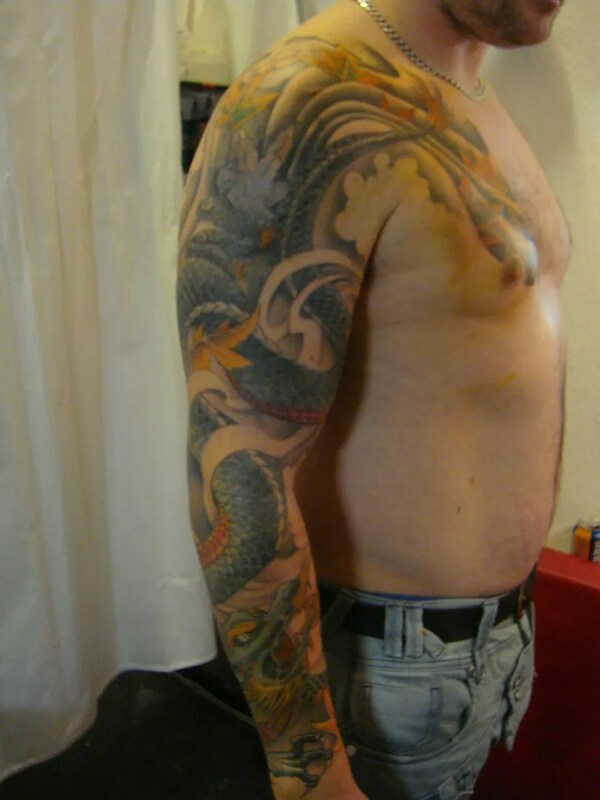 For some reason he only managed to get two laser sessions, I was expecting at least 4, and the old tattoo wasn’t faded enough yet. I drew on the new piece and lined it, but Donald will have to go back to get more lasering done before i will do the shading. 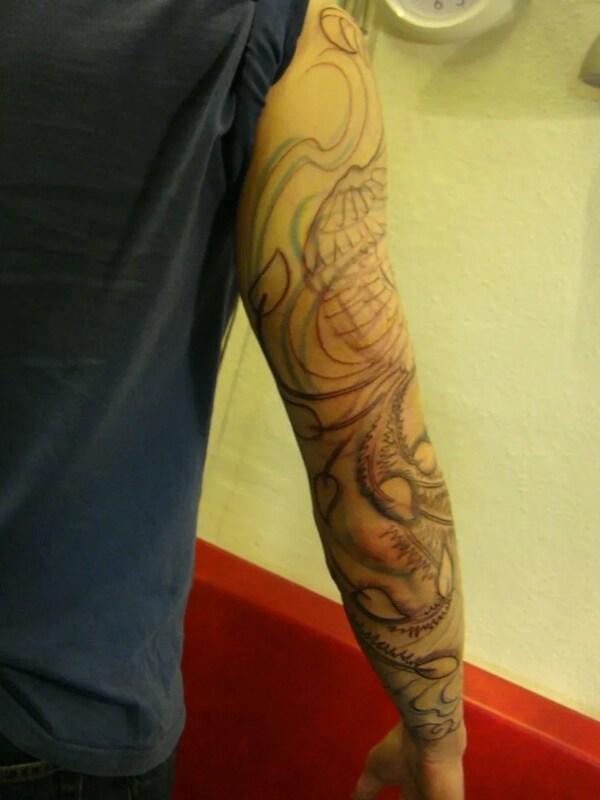 In the meantime he will have to live with the two tattoos together. 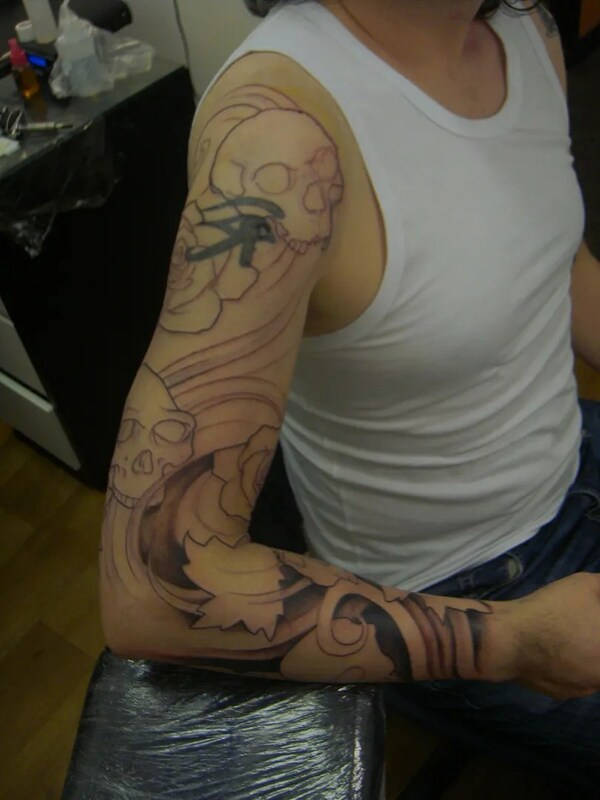 It’s not the end of the world of course, but it’s not ideal, either. 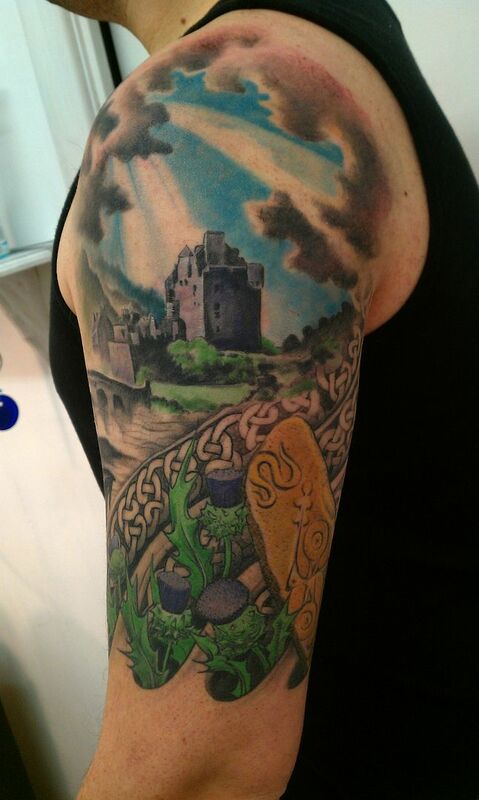 I think i will have to change my strategy and not book any tattoo time until I’ve seen the old piece a few laser sessions in, to gauge how it is progressing and what end result we can expect. 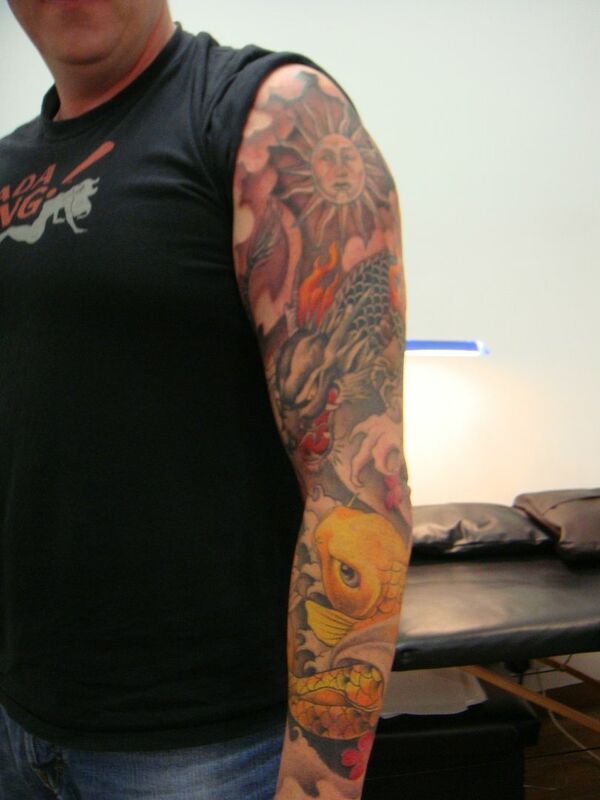 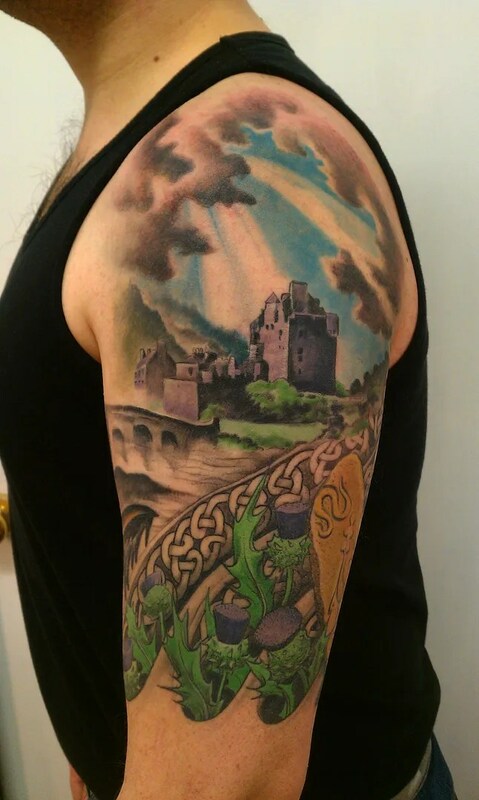 Barry is in the process of getting his sleeve finished, it’s taken a while as he disappears off to UAE for 3 months at a time, and we have to get an appointment in when he is back for a couple of weeks. 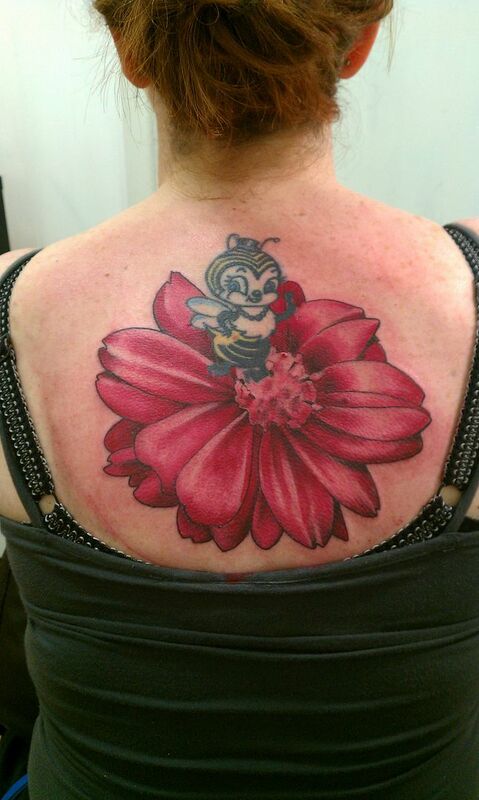 Melissa wanted a nice big flower for her cute bee to sit in, voila! 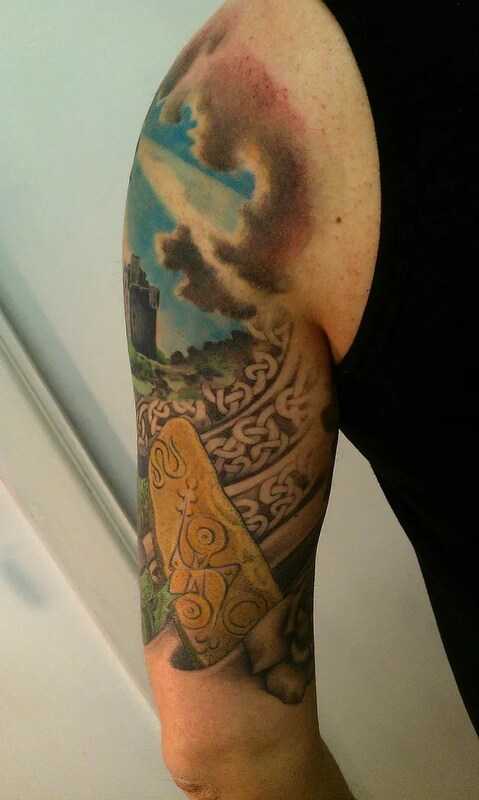 On thursday i went to the national museum on Chamber street to see the Viking exhibition on there. 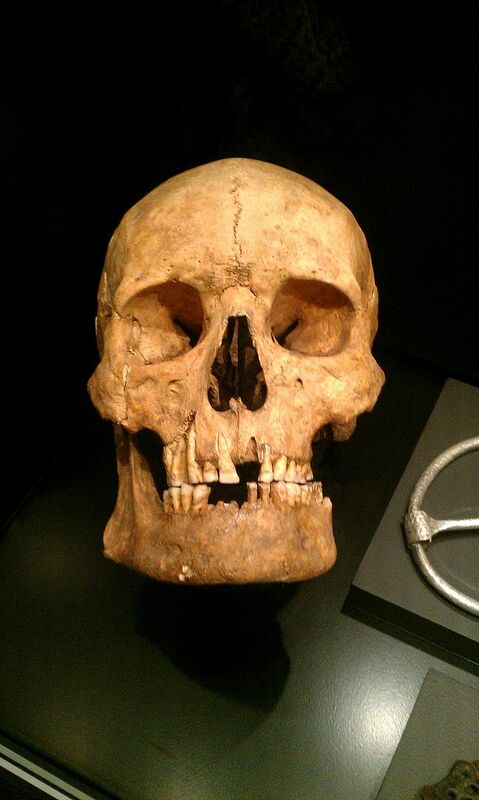 There is a Viking skull on display, which shows that they carved lines into their teeth for decoration, how’s that for Body Modification? I tried to take a photo of it, but it’s not too clear, look closely at the front upper teeth, you can see a ridge right across from eye tooth to eye tooth. 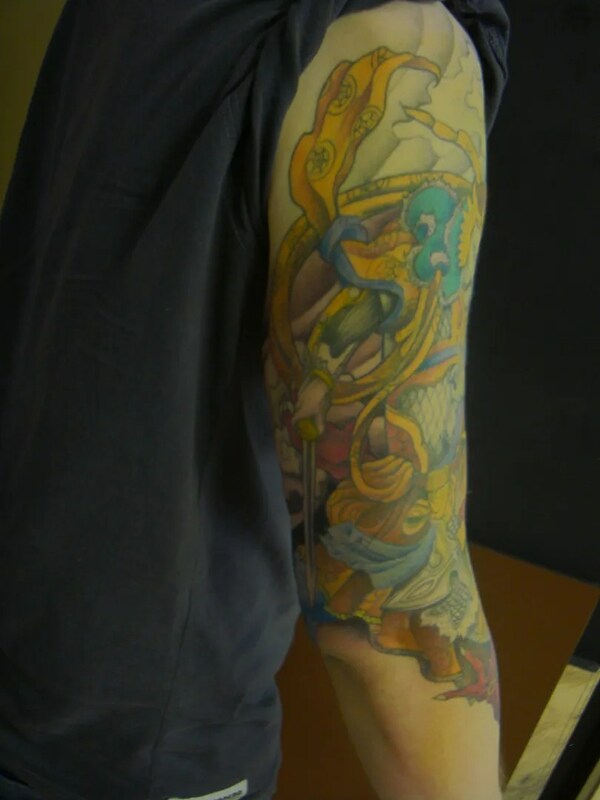 Nutters! 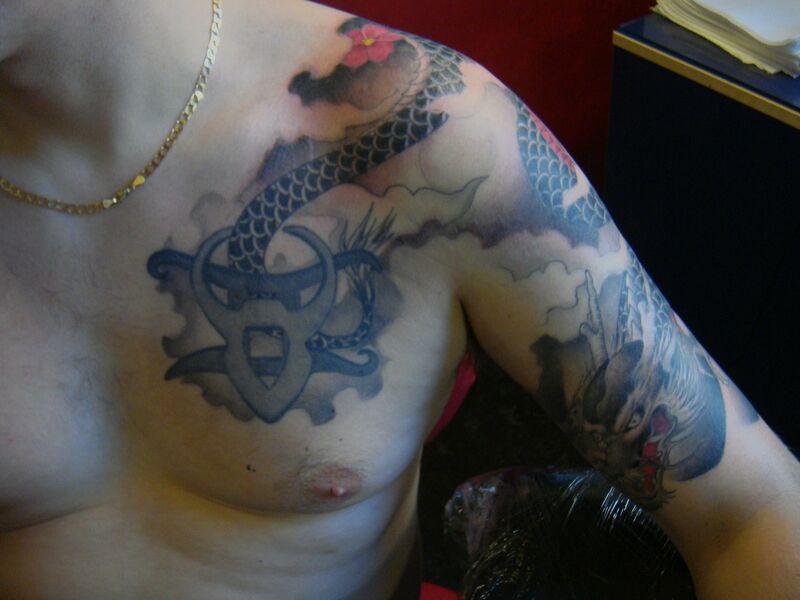 According to one eyewitness, the Vikings were also tattooed from ‘nail to neck’, but there remains no evidence of that. 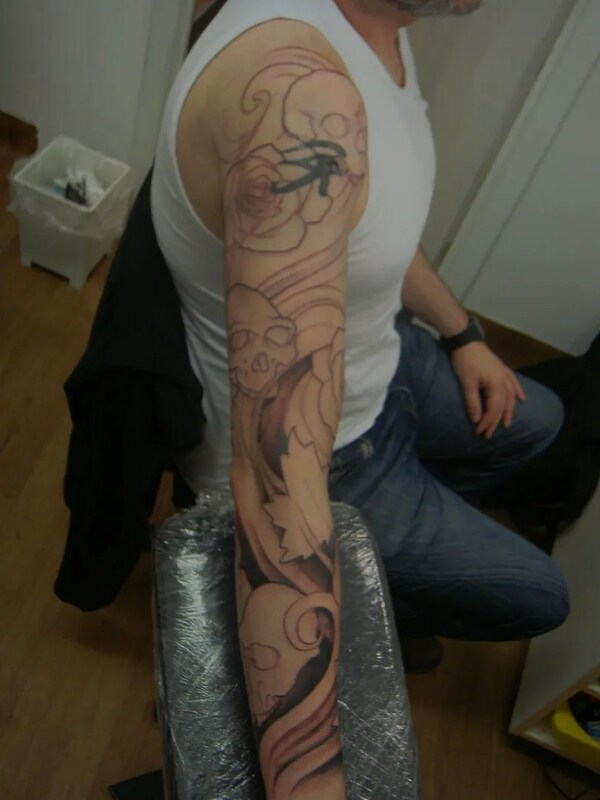 I do believe that decorating out bodies in a permanent way is somehow hard wired into our brains, most cultures seem to have a history of it. 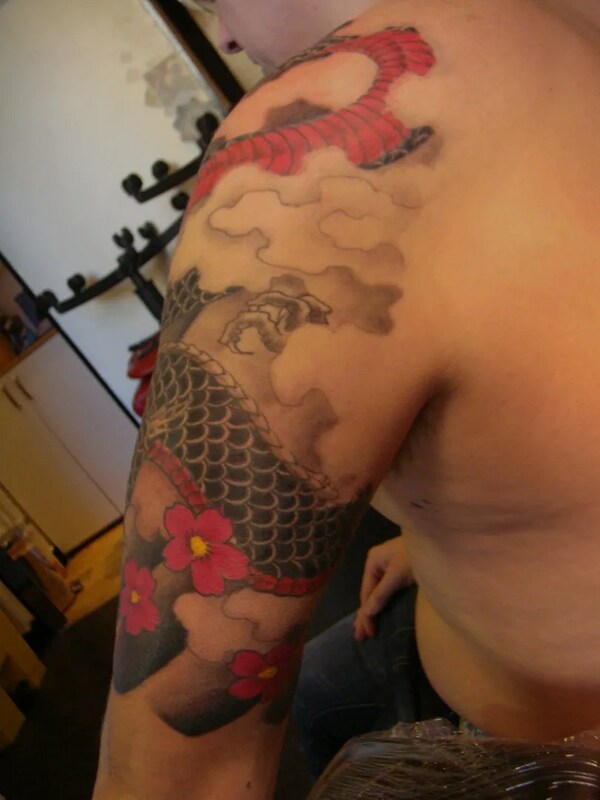 The national museum also has some great japanese stuff. 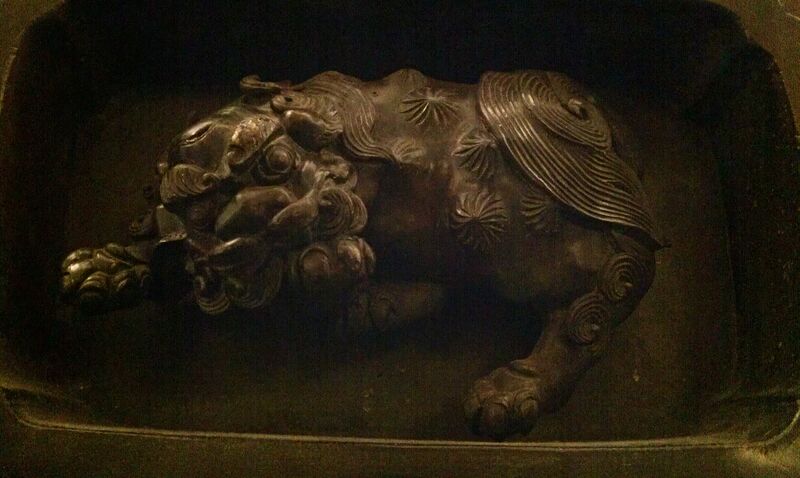 I discovered a massive bronze lantern that is covered in the most beautiful creatures, including a row of shishi/ foo dogs around the base. 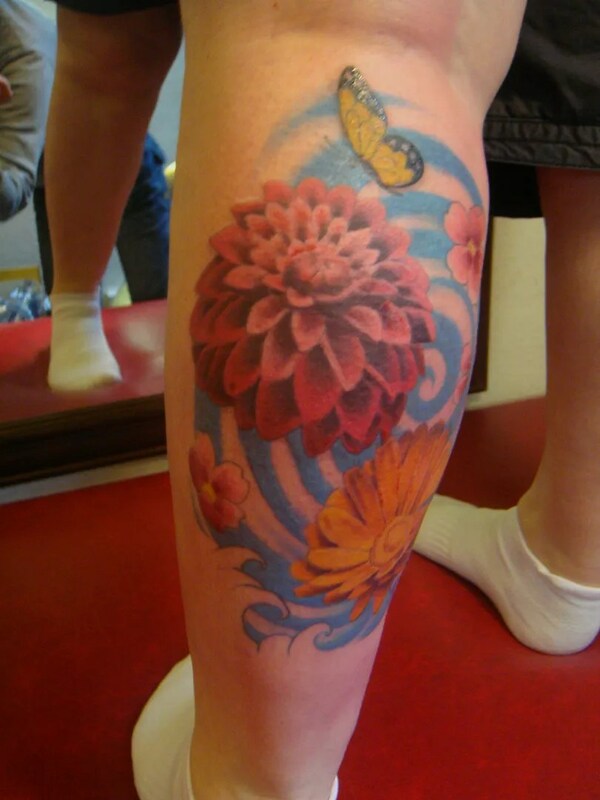 You don’t usually see these in a 3D form, so i was all over them like a rash, taking photos from all angles. 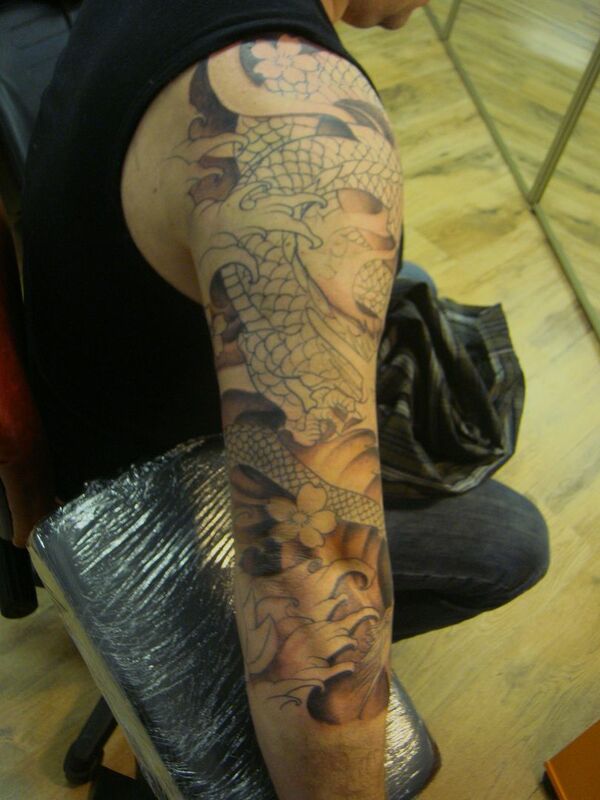 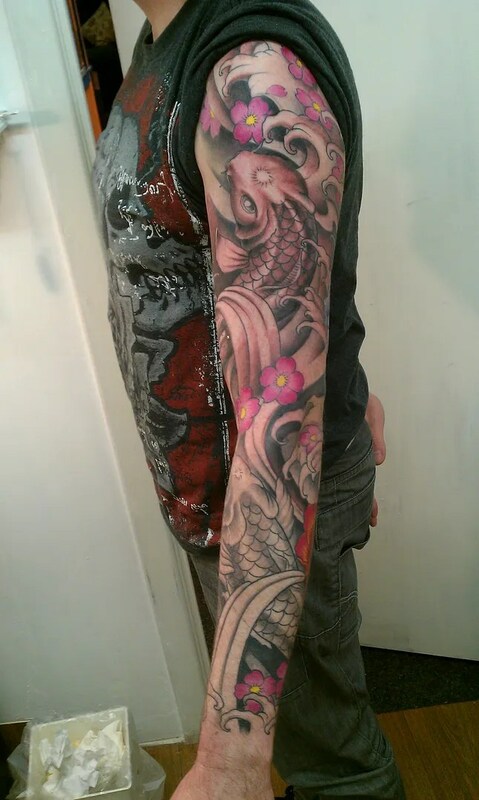 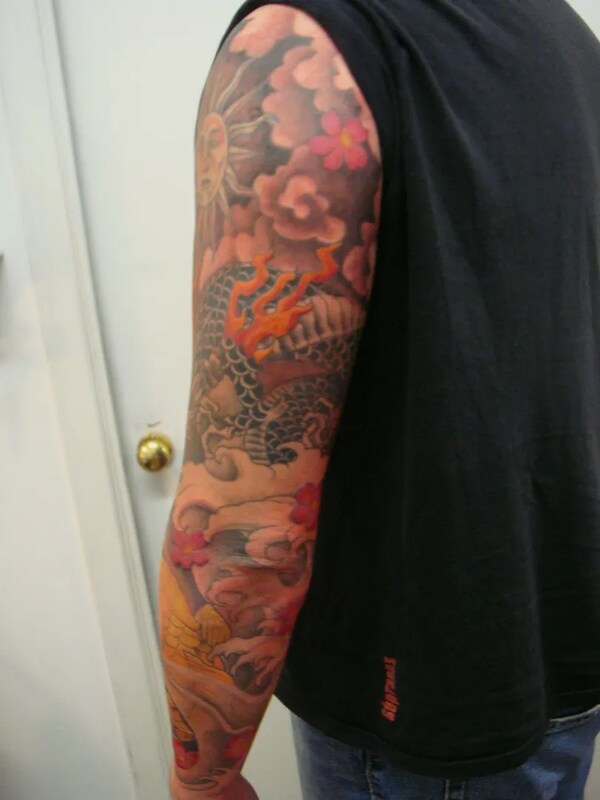 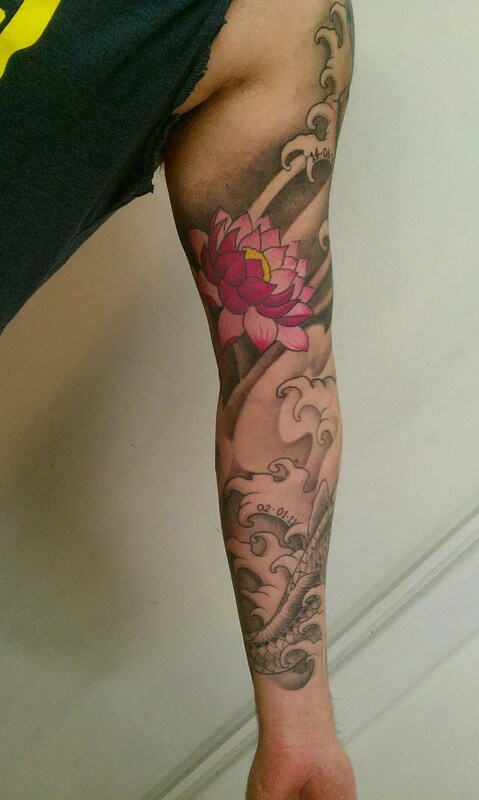 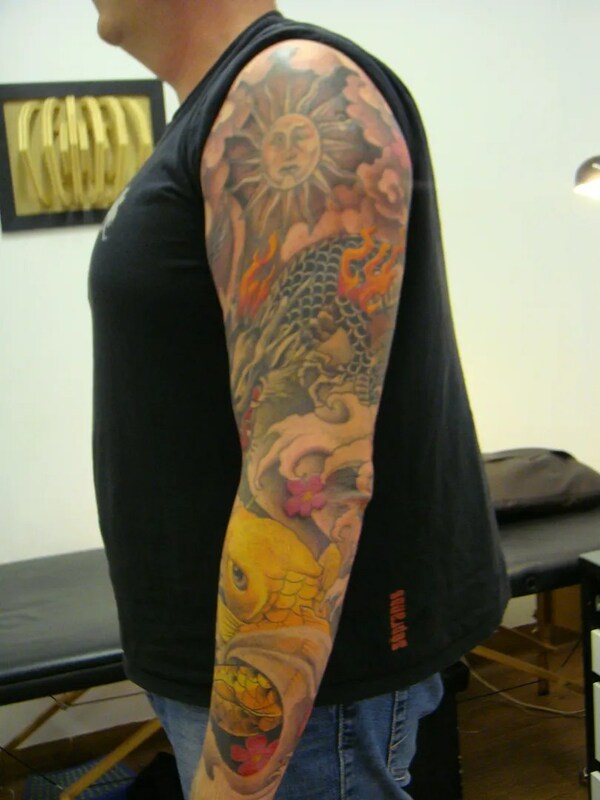 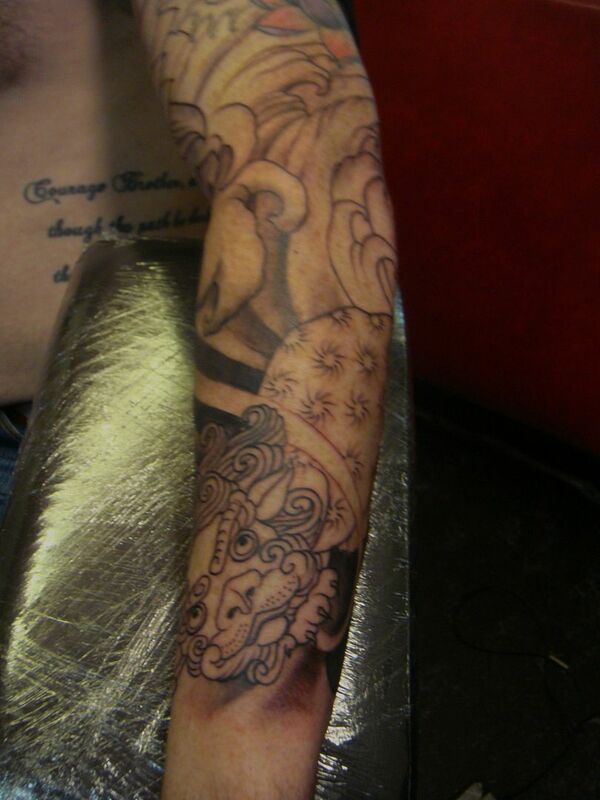 My customer the next day was in to get a half sleeve, but mentioned that he might be interested in taking it down to a sleeve, with maybe a foo dog..
adapted to fit his arm and the tattoo style of course, but there he is at the wrist, wrapping up to over the elbow. 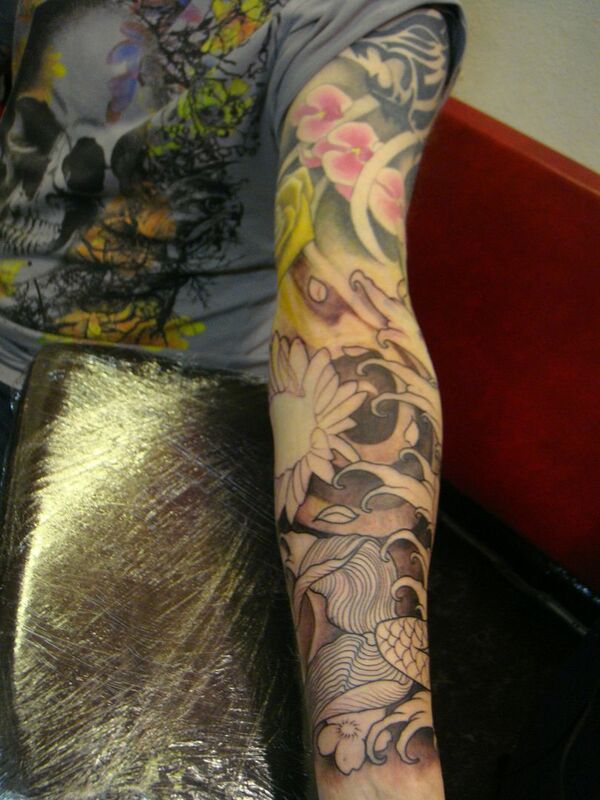 the koi and sun at the top of Stephens arm was existing work by another artist, which we are adding to, as is the cross on the forearm. 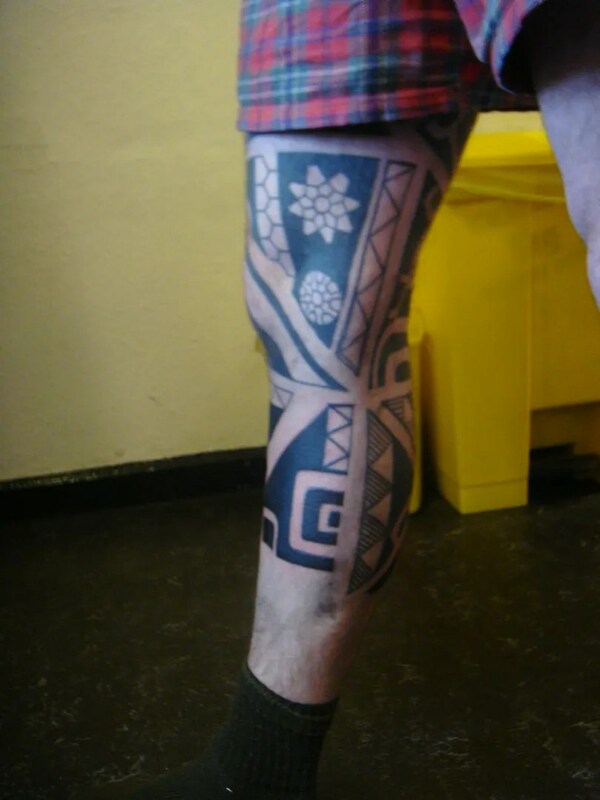 Roddy is working on a polynesian style body suit, we started this a good few years ago and are slowly chipping away at it. 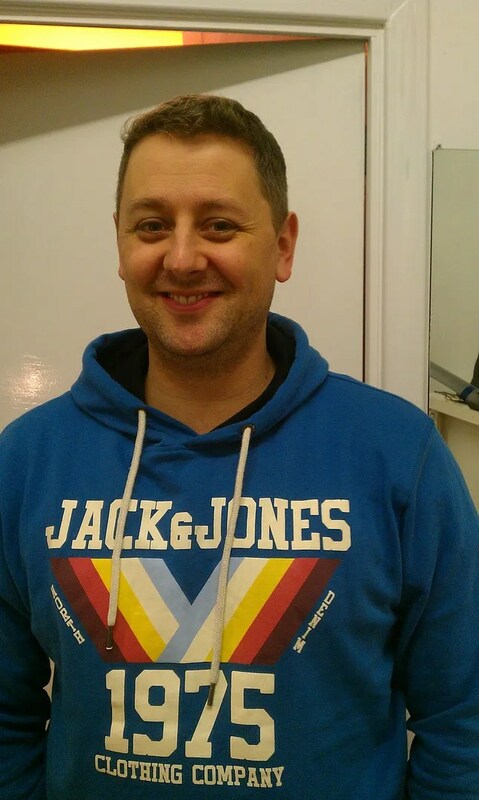 This will be his last session before the summer, as Roddy is a motorcycle racer and will be busy until autumn now. 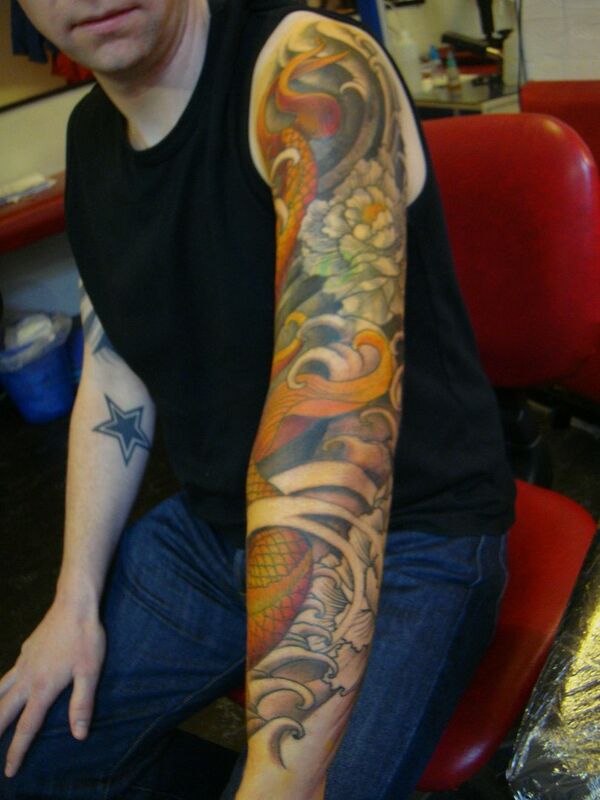 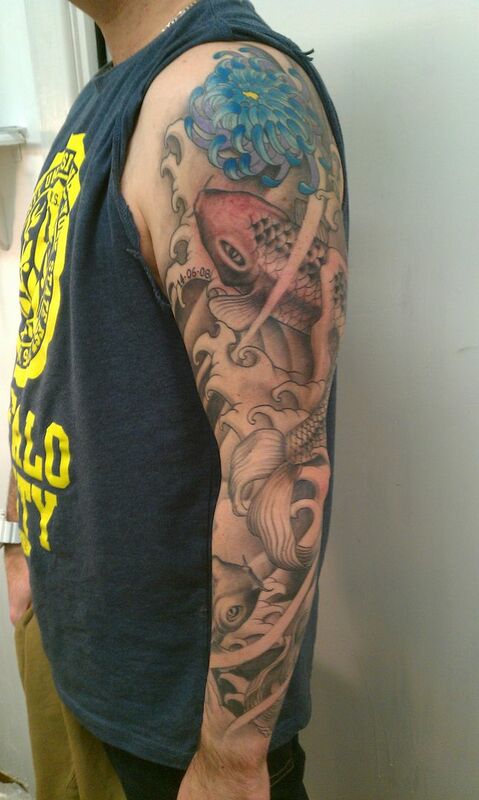 Neil got some colours put in his koi today, i took some terrible photos, sorry! 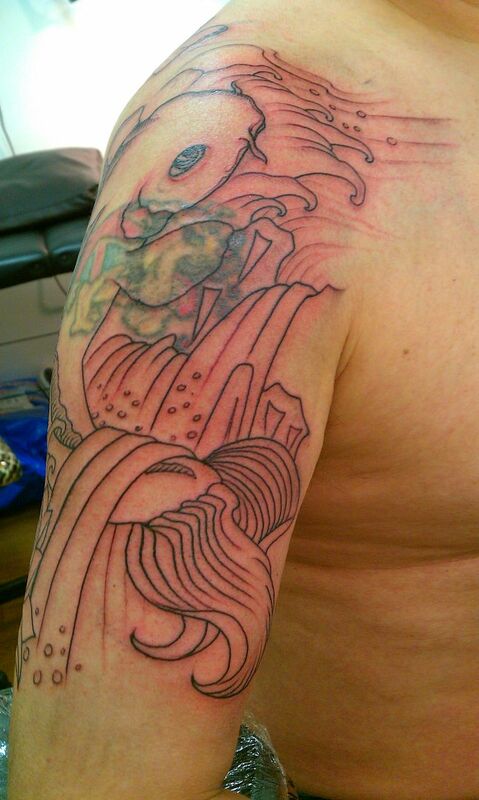 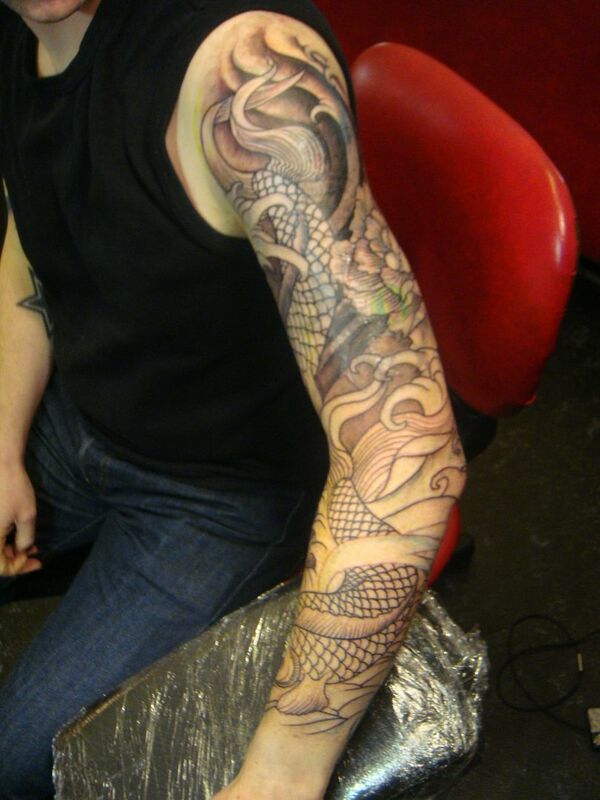 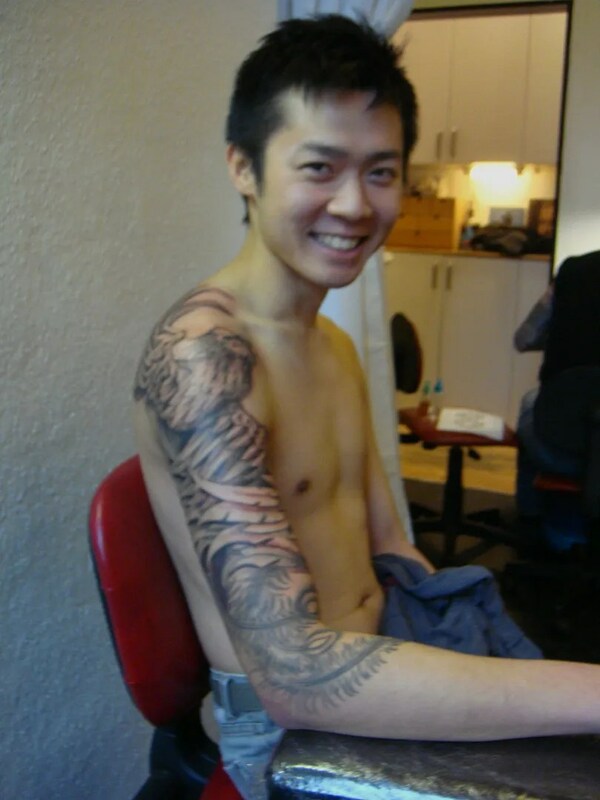 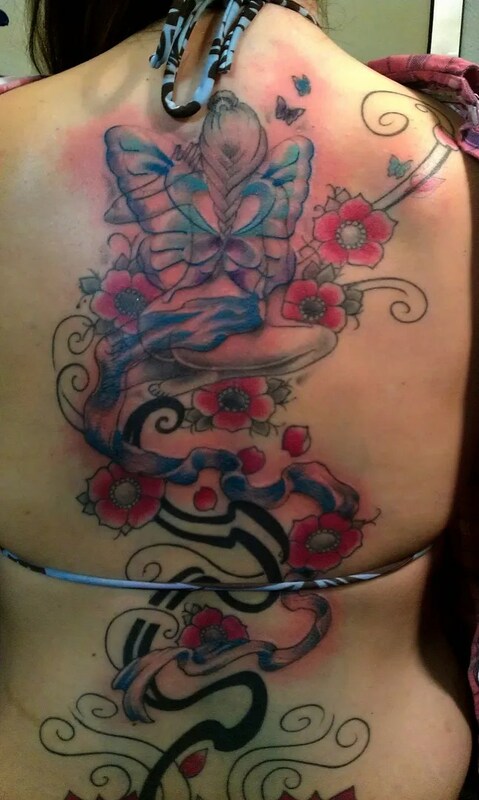 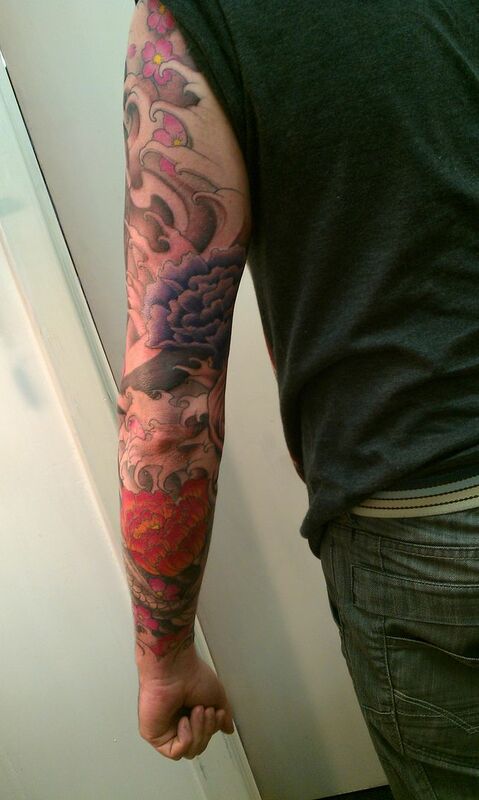 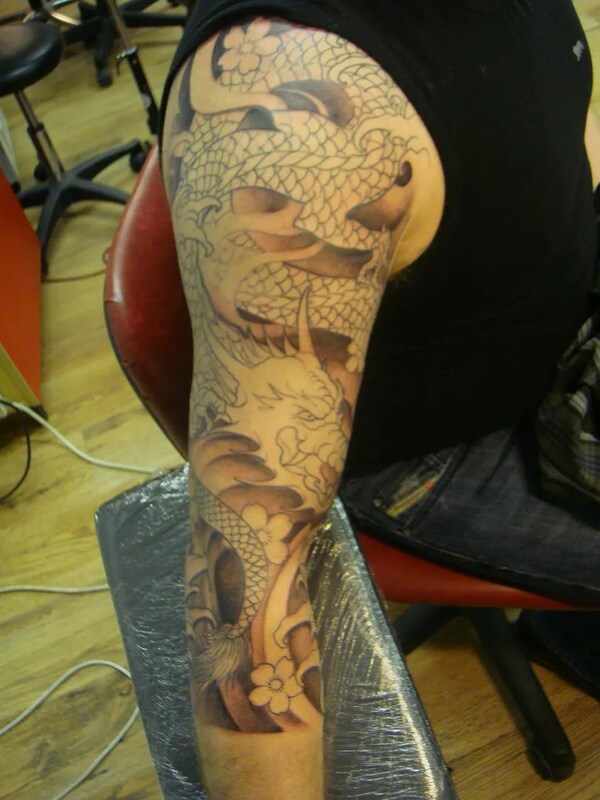 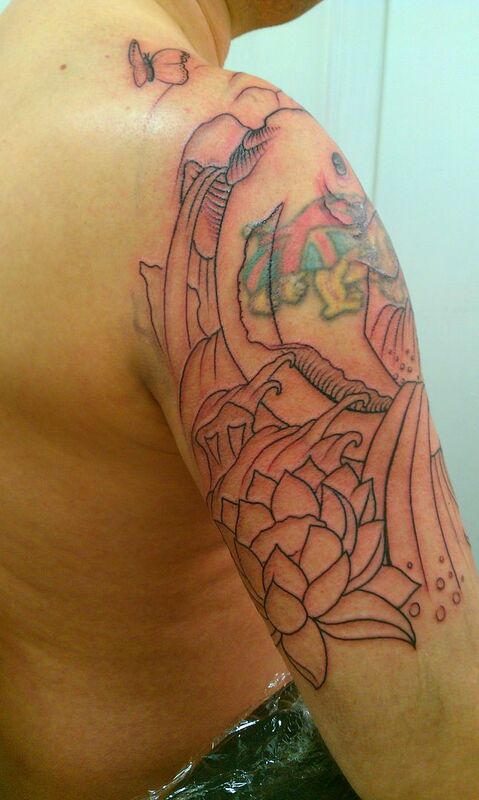 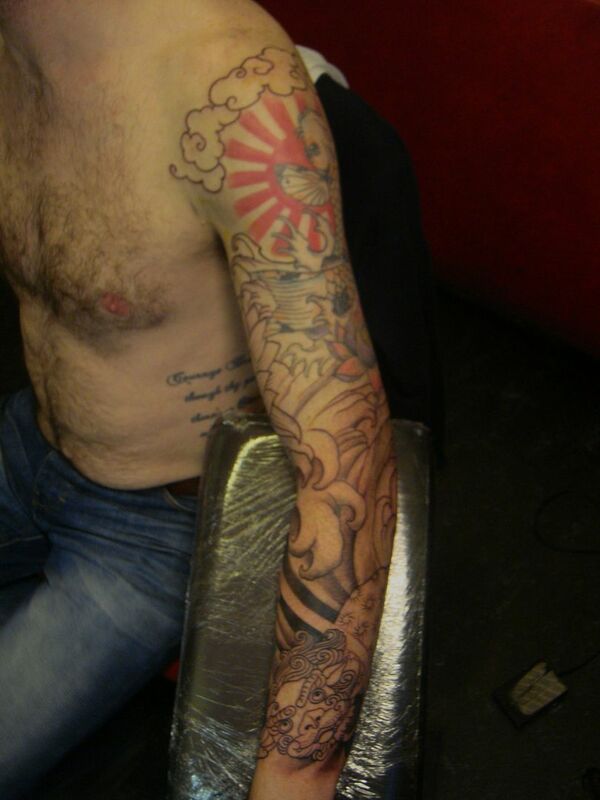 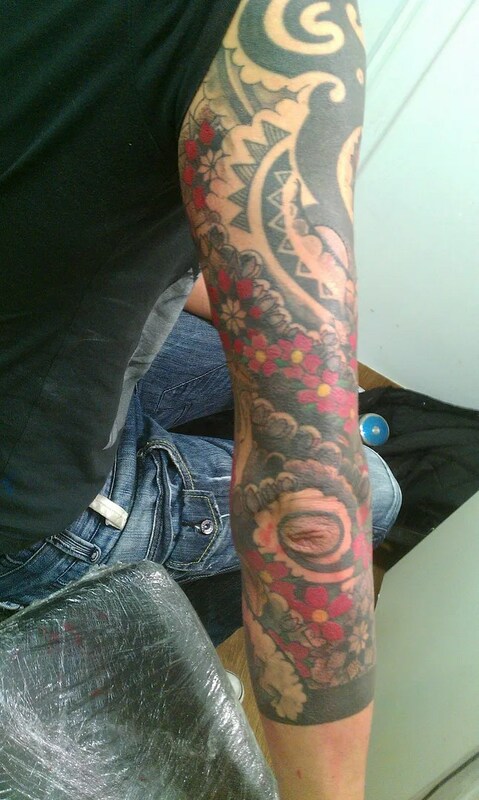 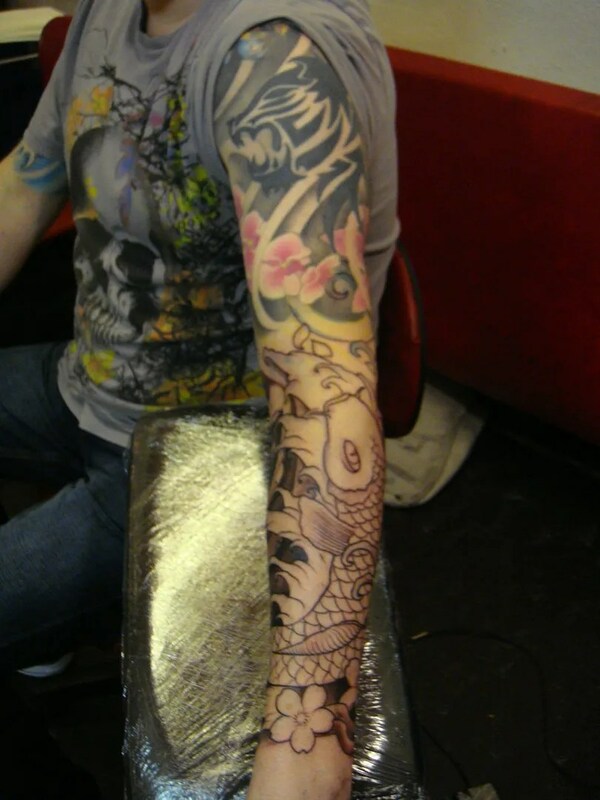 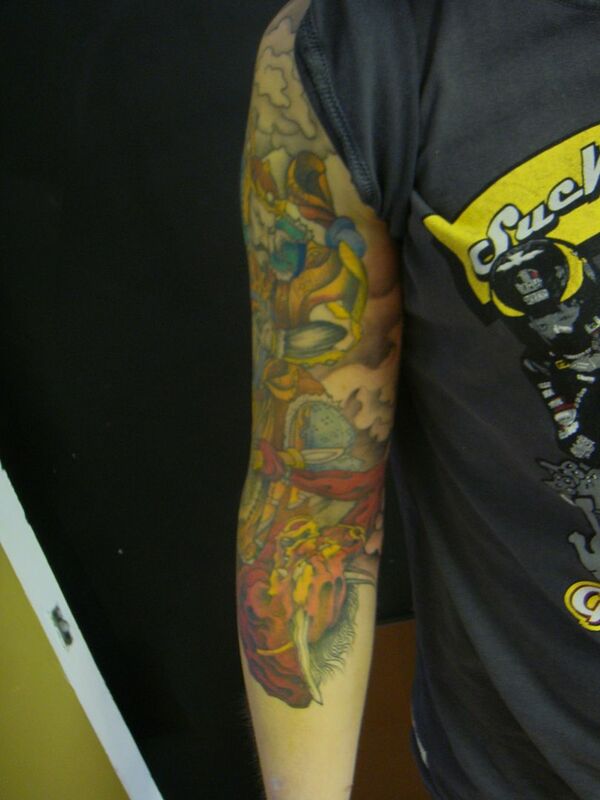 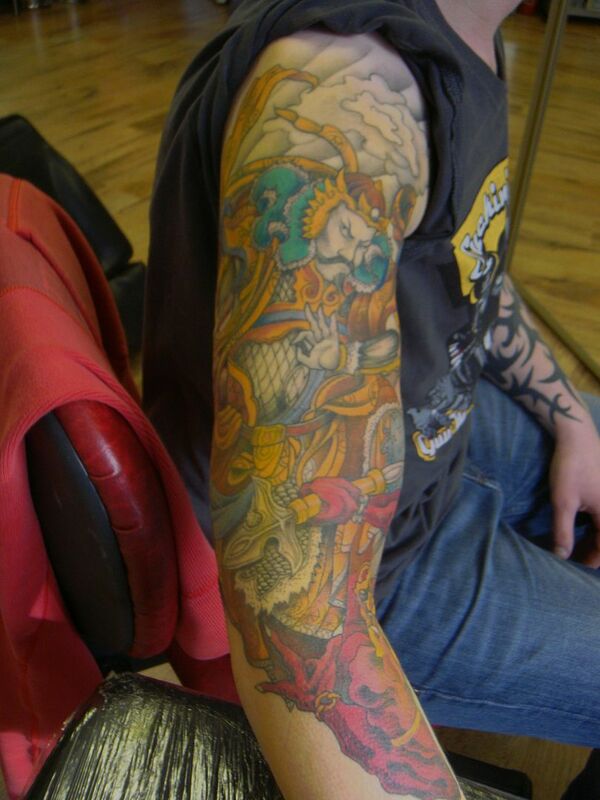 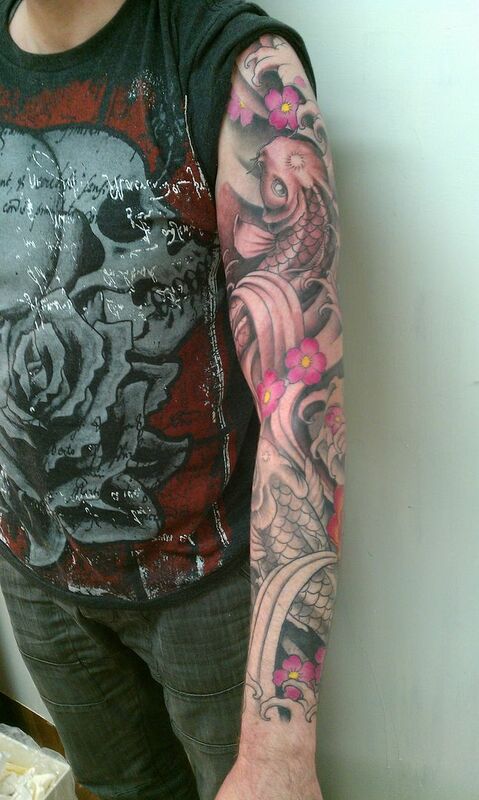 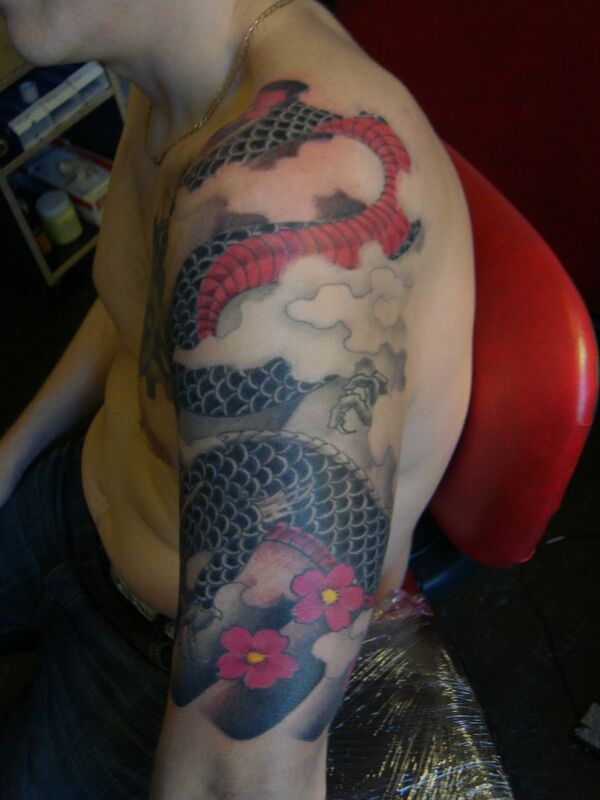 William is getting a Horiyoshi warrior and demon, we are adding colours and some clouds. 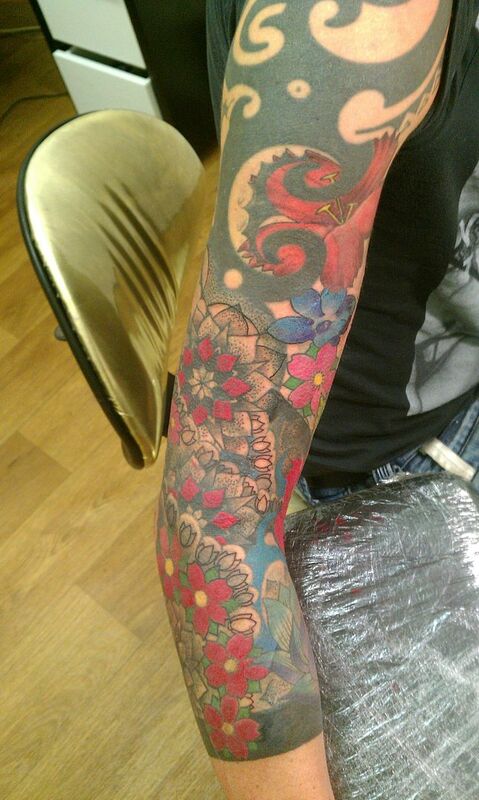 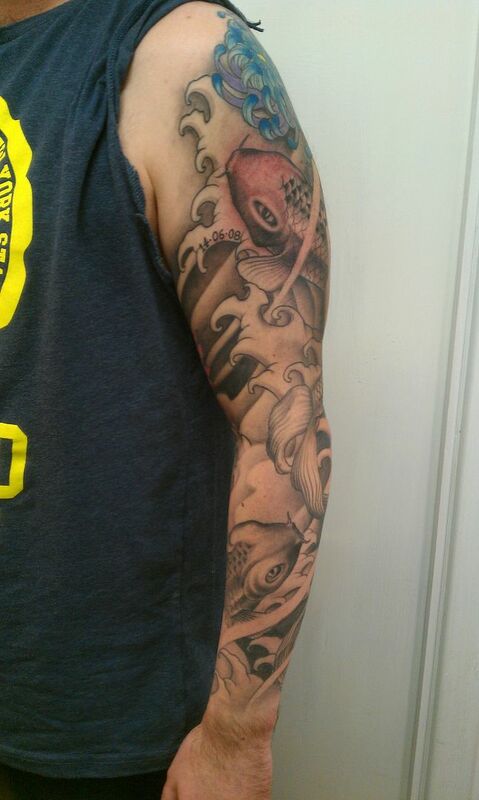 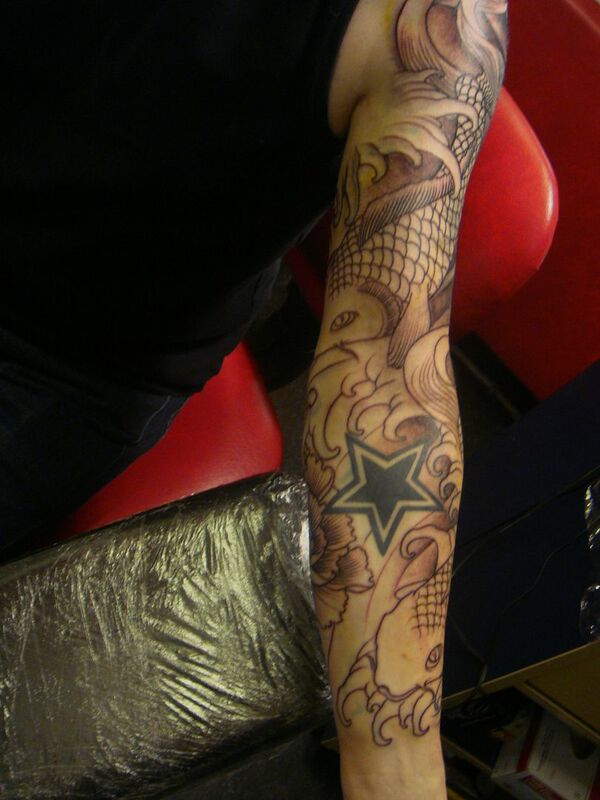 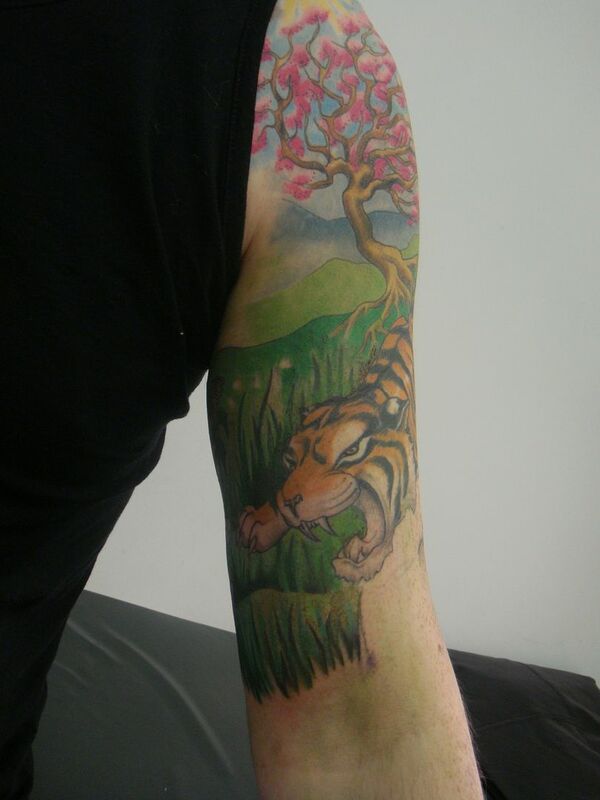 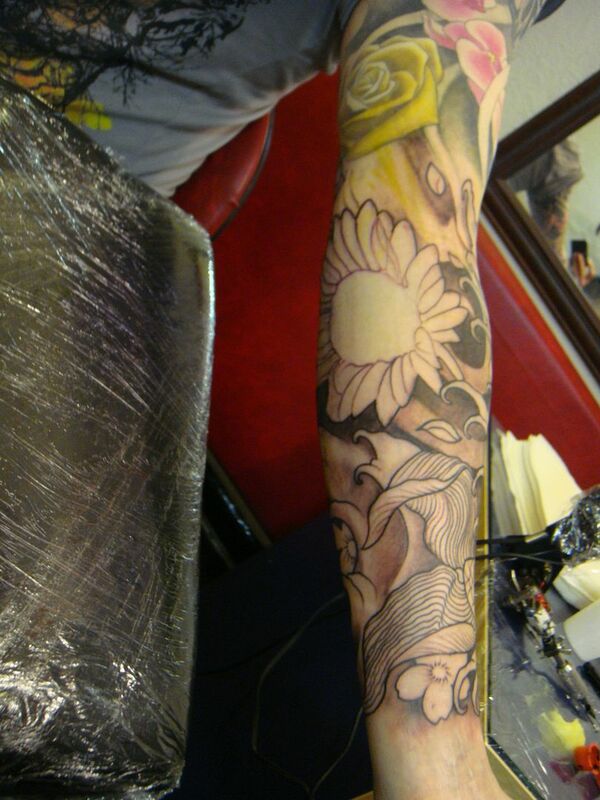 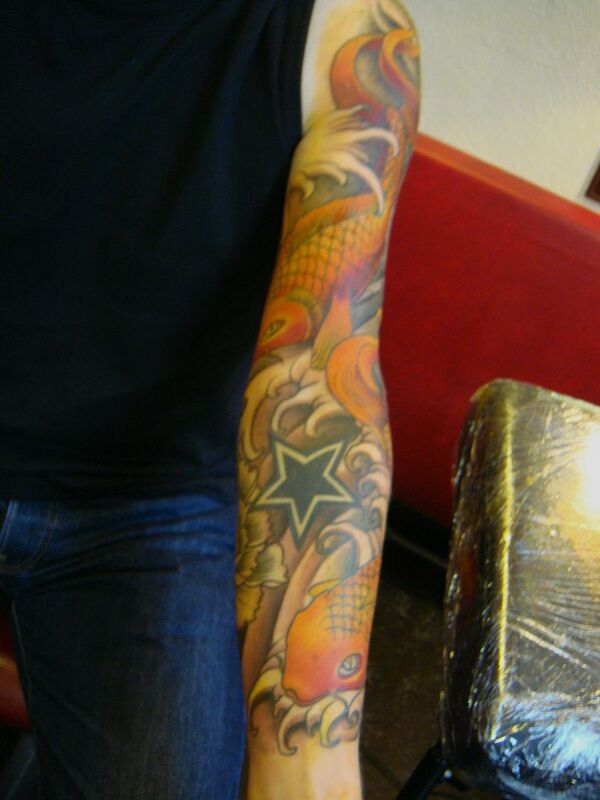 Next time we will add some flowers on the forearm to make it a sleeve. 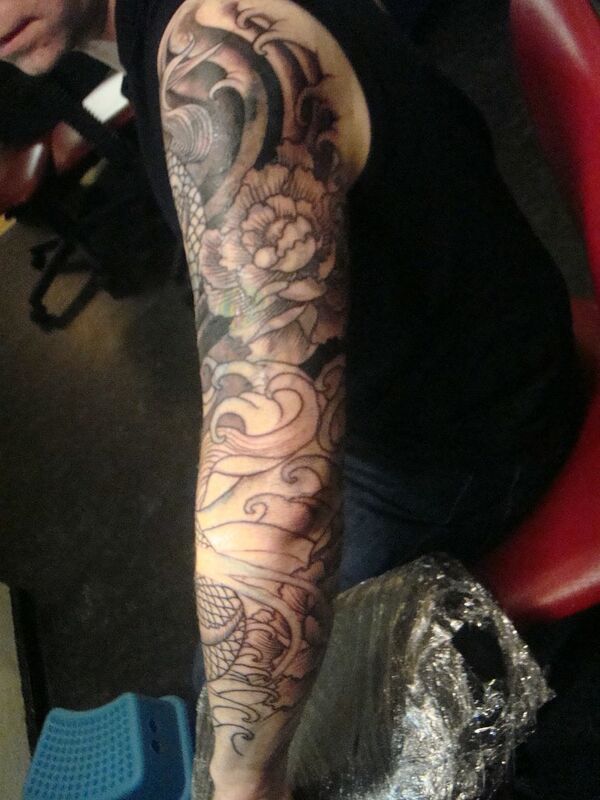 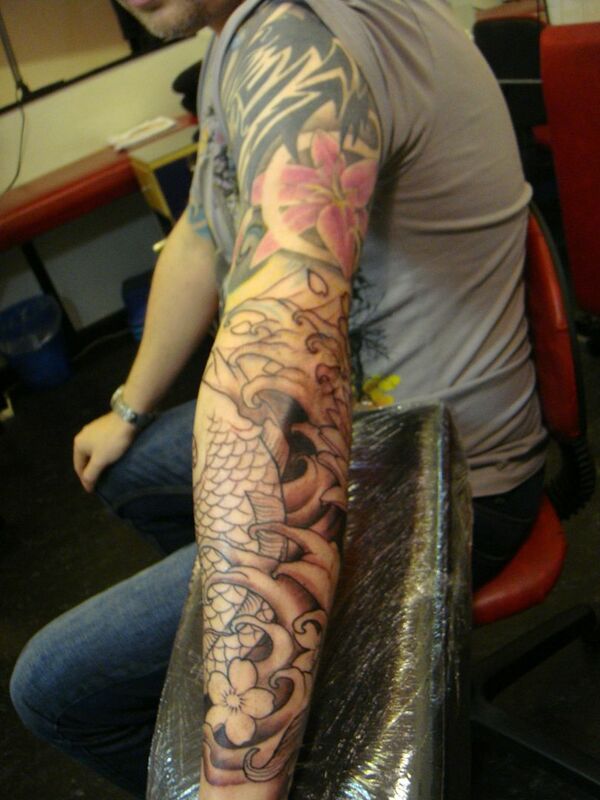 And Ian was after a skull and roses with maple leaves, all swirling around his arm. 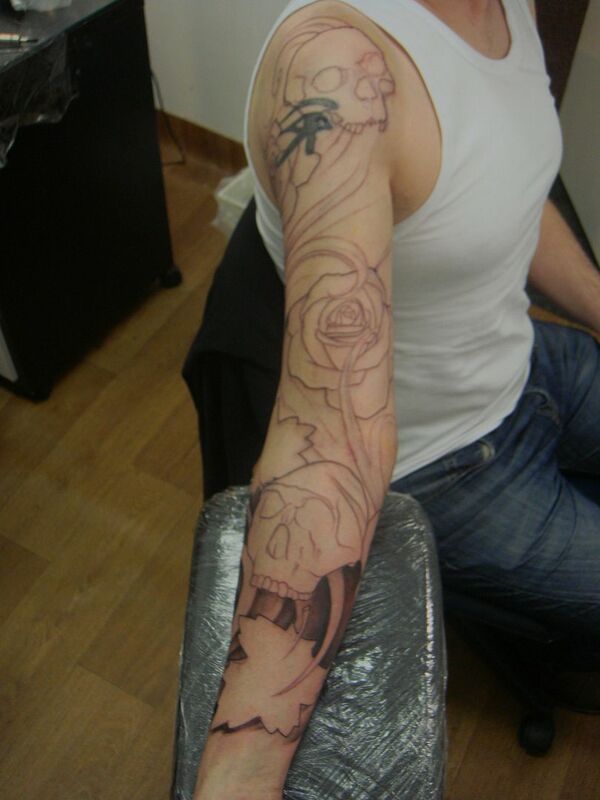 The skulls represent the evolutionary stages of the human skull, and the roses and leaves are representative of life and movement. 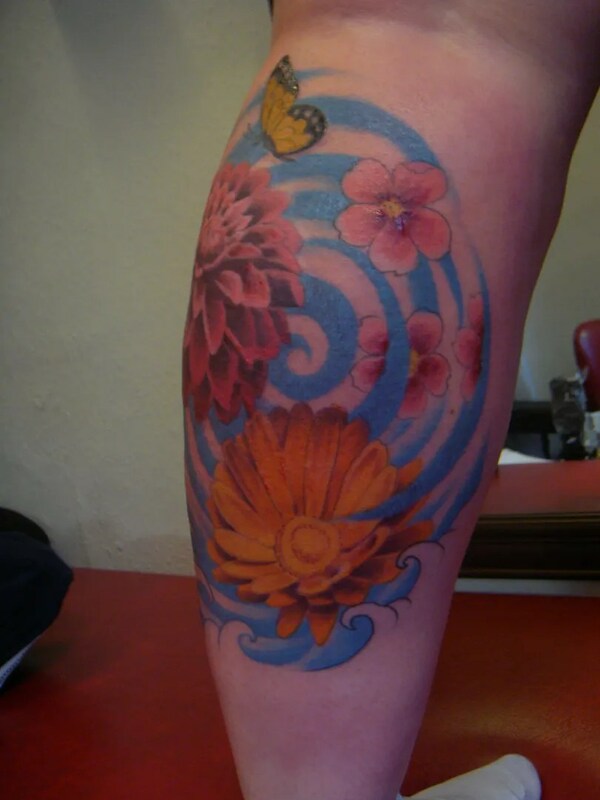 A while ago Susan started on this whirlpool and flowers design, we just had the aster to finish and some bits of pink to add to the cherry blossoms. 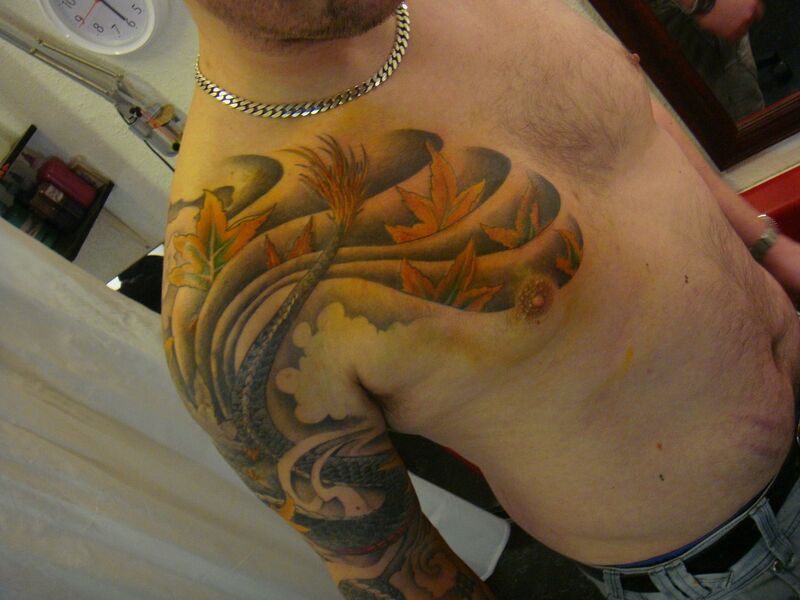 Ross was in again, one last wee session to tidy things up and give the last maple leaf some colour. 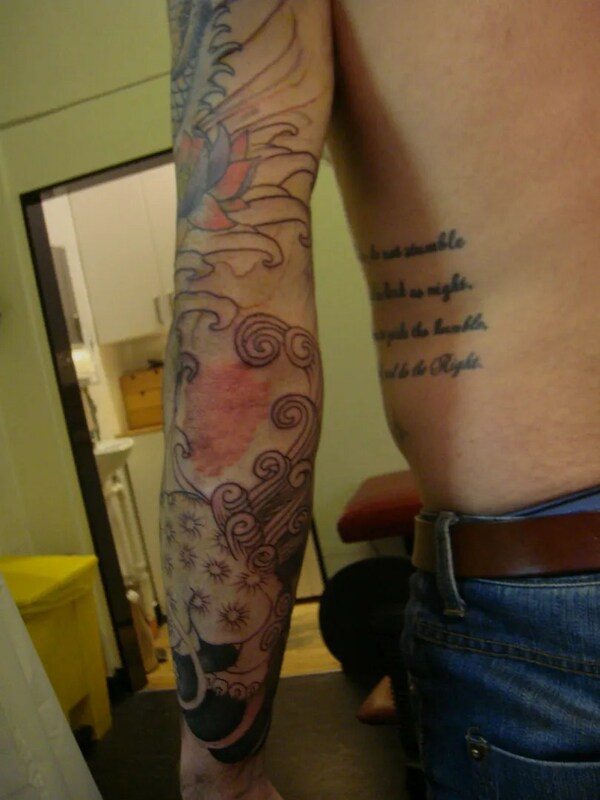 We’ve been sparing it out until now because it was still getting lasered. 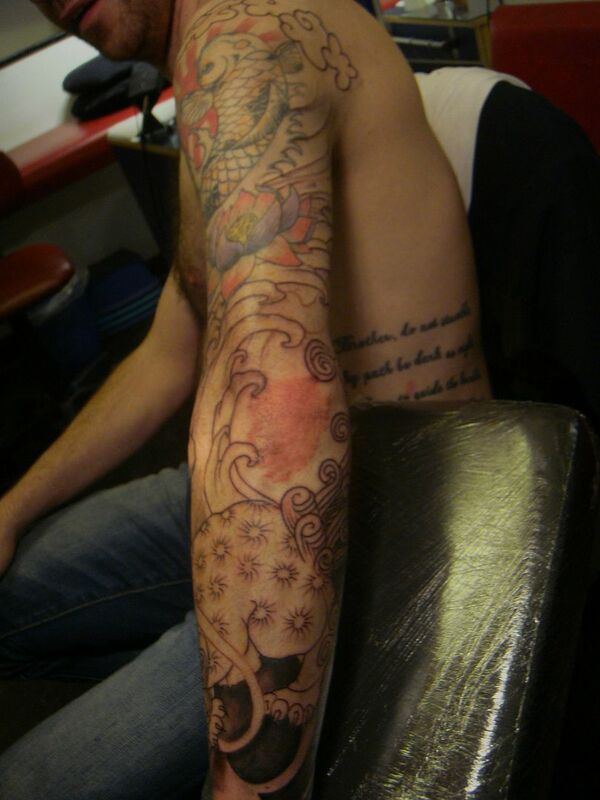 It needs a few more weeks to settle, and then we will be able to complete Ross’s sleeve. 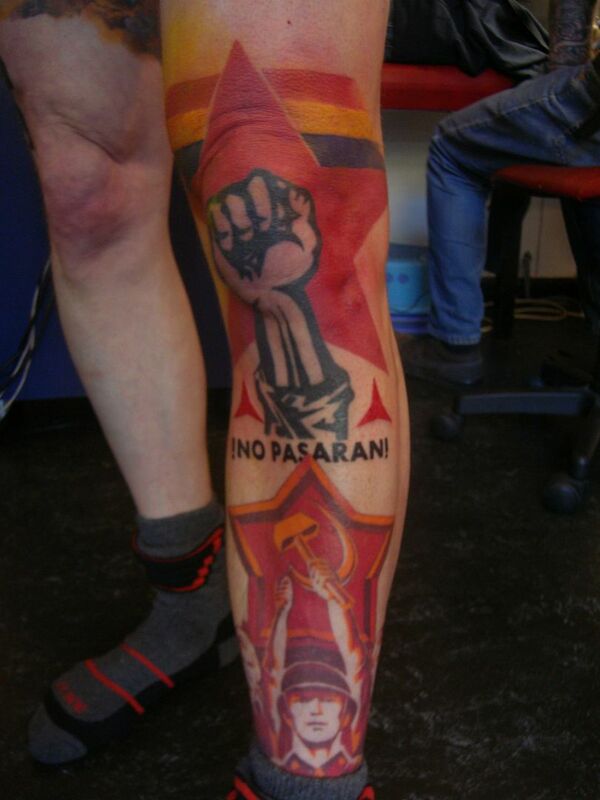 Brad is working on a collage of revolutionary propaganda images, today we just added some colour and a bit of script. 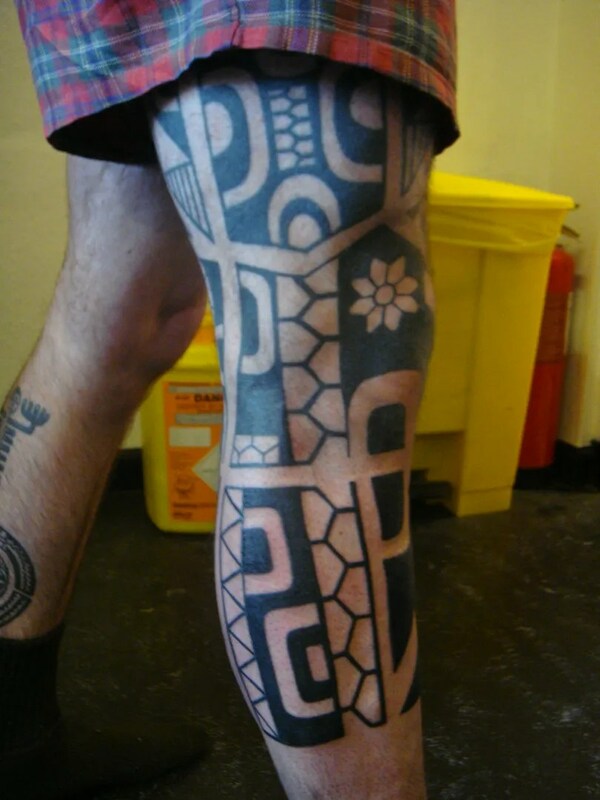 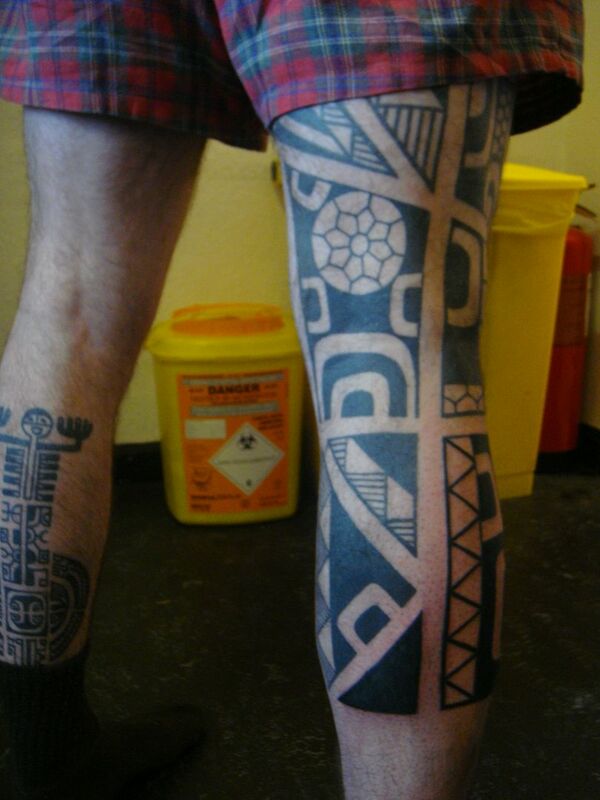 The top of the leg will be an interpretation of Picasso’s Guernica, i’ve never seen that tattooed before, it’s going to be quite something! 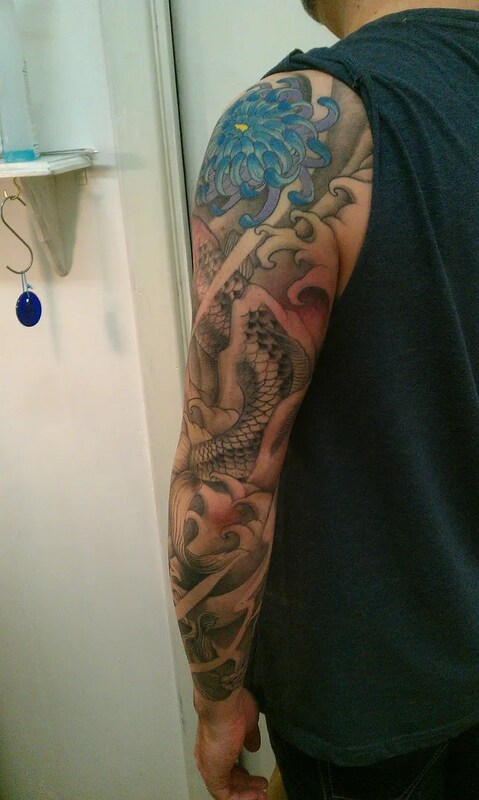 But there ya go, another one bites the dust!